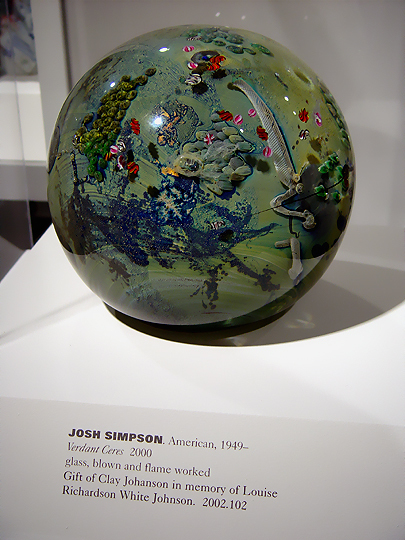 When I met Josh Simpson for the first time in March 2000 (at Vespermann Gallery in Atlanta, Georgia), we began to make plans for me to donate one of his megaplanets, the very largest glass worlds that he creates, to the MMCD. Over the next few months, we were in regular communication with each other as we discussed the dynamics of how I would donate one of his works. In June 2000, Josh sent me a set of slides and transparencies showing the three megaplanets that he had available to choose from... their names at the time were simply "M1", "M2", and "M3". I spent some time poring over the images of the different works just to see which ones I liked, and then handed them off to the director of the MMCD so that he could select a work which I would then donate to the museum. Within a week, the director of the MMCD told me that the museum liked both "M1" and "M2", but that they wanted to see the works in person so that they could be sure of their selection. I relayed this information to Josh, who sent "M1" and "M2" directly to the MMCD. Not long after, the director of the MMCD informed me that the museum preferred "M2", a lush, green megaplanet. I passed this information on to Josh, and we began to finalize the donation of "M2" to the MMCD. There is a huge amount of detail in this work... some of the visible features include fields of trees (made using embedded canework), some really cool swirly and bubbly glass effects, and an assortment of spaceships flying above the planet. 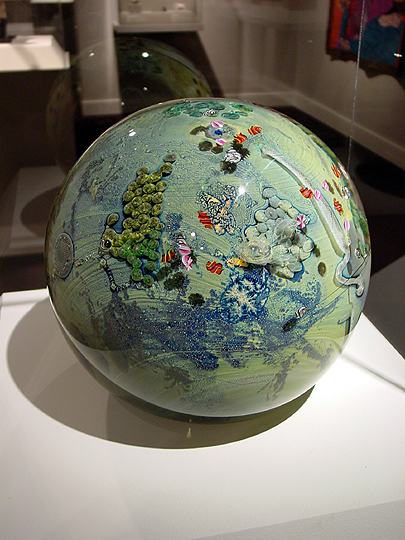 As with Josh's other planets, this megaplanet contains a world on the inside, visible through the base of the work. You could literally spend a week taking in all of the detail, there's so much of it. As to the name of this work... when I was talking with Josh, I remarked that I thought that works of this scale deserved better names than "Megaplanet" or "M2". Josh asked me if I had any suggestions, so I sent him three suggestions based on Greek and Roman mythology. For this work, I suggested the name Ceres, the Roman goddess of agriculture, because the planet was lush and green. Finally, Josh and I settled on the name Verdant Ceres... "Verdant" to reflect the greenness of the work and "Ceres" in keeping with the mythological theme we had already established with Dark Persephone. 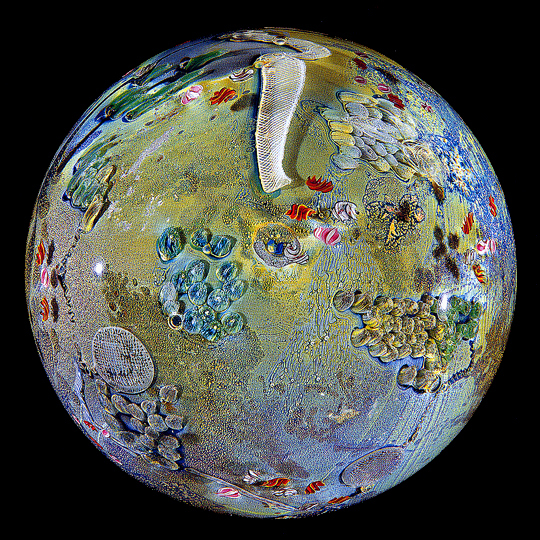 April 2001 update: Verdant Ceres is now featured on page 119 of the new book JOSH SIMPSON Glass Artist. Although it's listed in the book simply as "Megaplanet", it's definitely the same work. 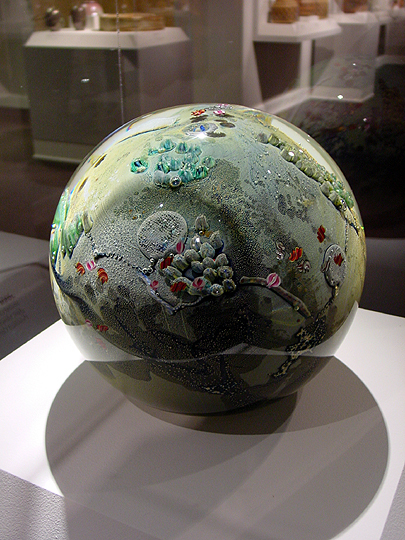 Verdant Ceres also appears in the documentary Where the Earth Meets the Sky: The Glassworks of Josh Simpson, produced by PBS station WGBY in Springfield, Massachusetts. This work is donated in memory of my grandmother, Louise Richardson White Johnson, who passed away in October 2002.